The Indianapolis Colts today signed guard Kitt O’Brien to the practice squad. O’Brien, 6-5, 310 pounds, spent time with the Colts in training camp before being waived during final cuts on September 5, 2015. He played the last two seasons in the Arena Football League with the Cleveland Gladiators after his collegiate career at Ball State. In 2014, he started all 18 games for the Gladiators along the offensive line. As a rookie in 2013, O’Brien started all five games that he appeared in with Cleveland. At Ball State, he started 36-of-40 career games for the Cardinals. In 2012, O’Brien played in all 13 games (10 starts). As a junior in 2011, he started all 12 games for the second time in his career and was part of an offensive line that tied for 12th in the nation for fewest sacks allowed with 11.0. In 2010, O’Brien started all 12 games at right guard for the first time in his career. He played in three games as a freshman and started two contests. The Indianapolis Colts today elevated wide receiver Quan Bray to the 53-man roster from the practice squad and waived safety Dewey McDonald. Bray, 5-10, 182 pounds, has spent the entire season on the team’s practice squad. He was originally signed by the Colts as an undrafted free agent on May 5, 2015 and was waived and signed to the practice squad following final cuts on September 5. Bray finished his career at Auburn with 90 receptions for 849 yards and seven touchdowns. He ranks third in school history in punt return average (10.09) among players with at least 50 returns and eighth in punt return yardage (565). As a senior in 2014, Bray finished second in the nation in punt returns (18.1) and was a Second Team All-SEC selection as a return specialist, voted by the league’s coaches. McDonald, 6-0, 220 pounds, was elevated to the Colts 53-man roster from the practice squad on October 20. He played in the team’s Week 7 loss to the New Orleans Saints and assisted on two special teams tackles. 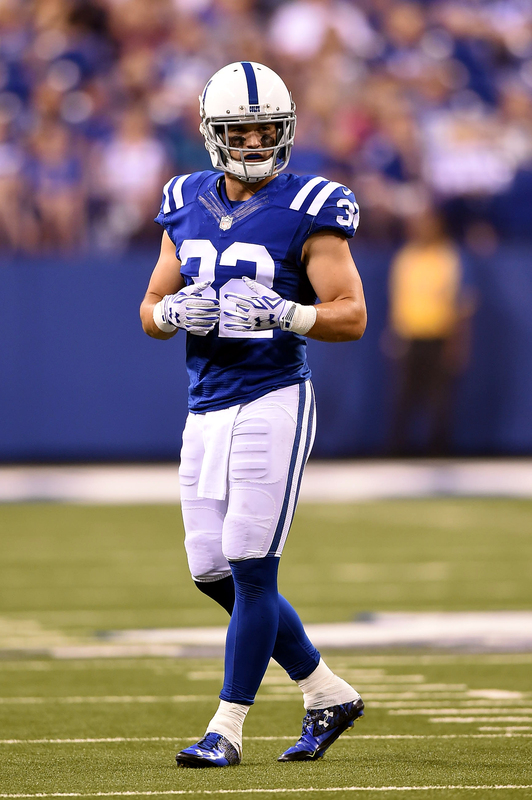 McDonald saw action in 12 games for Indianapolis as a rookie in 2014 and finished second on the team with 13 special teams tackles. He also saw action in all three postseason contests for the Colts and registered three special teams tackles. The Indianapolis Colts today signed inside linebacker Amarlo Herrera to the practice squad. Herrera, 6-1, 249 pounds, was signed to the Colts 53-man roster from the practice on October 17 and assisted on a special teams tackle in the team’s Week 6 loss to the New England Patriots. He previously spent the first five weeks of the season on the team’s practice squad. Herrera was selected by the Colts in the sixth round (207th overall) of the 2015 NFL Draft. He started 43-of-54 games at Georgia and totaled 334 tackles (147 solo), 21.0 tackles for loss, 3.5 sacks, four forced fumbles, two fumble recoveries, 11 passes defensed and three interceptions. The Indianapolis Colts today signed tight end Sean McGrath to the practice squad. The Indianapolis Colts today signed free agent cornerback Tony Carter. The team also signed quarterback Matt Blanchard to the practice squad. Carter, 5-9, 175 pounds, played the last four seasons (2011-14) with the Denver Broncos. He spent the entire 2015 training camp with the Broncos before being released during final cuts on September 5. Carter has played in 42 career regular season games (three starts) and five playoff contests with Denver and the New England Patriots. He has totaled 42 tackles (37 solo), 22 passes defensed, three interceptions, three fumble recoveries and six special teams tackles. In 2014, Carter played in eight regular season games for the Broncos and registered five solo tackles, one pass defensed and one fumble recovery. He saw action in 12 games (two starts) in 2013 and tallied 11 tackles (10 solo), eight passes defensed, one interception and two special teams tackles. Carter appeared in two playoff contests and made five tackles (four solo) and two passes defensed. In 2012, he set career highs in every category as he collected 24 tackles, 12 passes defensed, two interceptions, one fumble recovery and two defensive touchdowns (one fumble return, one interception return) in 15 games. His 12 passes defensed were the most by a non-starter in the NFL. Carter played in one postseason game and made one special teams tackle. He saw action in Denver’s final three regular season games and both playoff contests in 2011 after spending two weeks on the Broncos practice squad. In 2010, Carter spent the first 13 games of the season on the New England Patriots practice squad before being promoted to the team’s 53-man roster. He appeared in two games and recorded one solo tackle. Carter originally signed with the Broncos as an undrafted free agent on April 27, 2009. He spent the first 14 weeks of the season on the team’s practice squad before being signed to the active roster on December 19, 2009. Carter played in two games (one start) as a rookie and totaled one solo tackle, one pass defensed, one fumble recovery and two special teams tackles. Blanchard, 6-3, 223 pounds, was most recently on the Cleveland Browns practice squad after spending the entire 2015 offseason and most of training camp with Green Bay Packers. In 2014, Blanchard spent the first 14 weeks of the season on the Carolina Panthers Injured Reserve list before being waived on December 9, 2014. Blanchard was signed to the Panthers practice squad on October 29, 2013, where he spent the final nine weeks of the 2013 season. Blanchard signed with the Chicago Bears as a free agent on January 7, 2013 and spent the offseason and training camp with Chicago before being waived on August 27, 2013. He originally signed with the Bears as an undrafted free agent on May 14, 2012 and was on Chicago’s practice squad for the first 12 weeks of the 2012 season before being waived. Collegiately, Blanchard was a three-year letterman at Wisconsin-Whitewater (2009-2011). He played in 34 games (25 starts) for the Warhawks and finished as the school’s leader in completion percentage (70.4) after completing 393-of-558 career passes for 5,106 yards, 44 touchdowns and the fewest interceptions (six) in school history. Blanchard also added 735 rushing yards on 140 attempts (5.3 avg.) and five touchdowns. He helped guide UW-Whitewater to a 45-0 record and three Division III national championships during his three seasons. As a senior in 2011, he started all 15 games and earned First Team All-Wisconsin Intercollegiate Athletic Conference honors after completing 220-of-319 passes for 2,852 yards and 23 touchdowns. Blanchard also rushed 96 times for 452 yards and two touchdowns. In 2010, he was named First Team All-WIAC after starting all 10 games he played in. He set a school-record for completion percentage (72.4) after connecting on 163-of-225 passes for 2,132 yards, 21 touchdowns and one interception. Blanchard carried the ball 30 times for 180 yards and two touchdowns. In his first season with the Warhawks in 2009, he saw action in nine games and completed 10-of-14 passes for 122 yards and one interception. Prior to UW-Whitewater, Blanchard began his collegiate career at Northern Michigan in 2008. He played in eight games as a freshman and connected on 4-of-8 passes for 75 yards.